Inis Arose is a beautifully fresh floral Irish perfume. Sorry, Inis Arose perfume is now retired and sold out. Inis Arose Irish perfume is an Eau de Parfum or EdP. Eau de Parfum contains the second highest levels of perfume oils and is very popular. At a concentration of 15-22% it is slightly lighter than a ‘pure’ parfum but may not be any less expensive. You could expect an eau de parfum to last four to five hours. 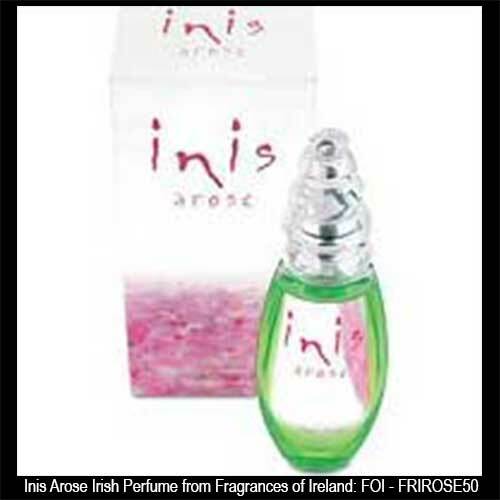 Inis Arose Irish Perfume from The Irish Gift House, comes in a 50ml (1.7 ounce) spray bottle and it is made in Ireland by The Fragrances of Ireland. Inis Arose Irish perfume is inspired by Aphrodite, goddess of love and beauty, famously depicted in Botticelli's painting "The Birth of Venus". As she arose from the sea a shower of roses came down from the heavens as a gift from the gods to mark the re-birth of love, beauty and fertility: and when she stepped onto the island of Cyprus, green grass and spring flowers magically grew up around her.